"Brush with Bamboo" is the world’s first plant-based toothbrush. Every component of this product is plant-based: bristles, handle, wrapper, and box. "Brush with Bamboo" is a USDA Certified Biobased Product by United States Government’s Biopreferred Program. A purchase of our toothbrush is a vote for biobased products that are not fossil fuel-based! Our product is BPA-Free, Vegan, and Verified Non-toxic. We’ve created a high-quality easy-to-grip curved handle made entirely out of bamboo. Only organic, wild, giant Chinese Moso Bamboo is used for our bamboo toothbrush handles. No pesticides or fertilizers are ever used on our bamboo – in fact, because it is wild mountain bamboo, doing so would be completely impossible. Likewise, our bamboo is never watered by us — only natural mountain rain. At present we are harvesting less than 1% of the possible bamboo resources available in the sprawling Chinese bamboo mountain range where our bamboo is harvested. Less plastic, more bamboo! This special SOFT bristle is composed of 62% Castor Bean Oil, 38% plastic. This is the latest and most advanced biobased bristle in the world today. It’s biobased, but still not biodegradable. You may have seen Dasani brand plastic water bottles made from 30% plants – our bristle is a similar concept. Prior to the invention of nylon in the 1930s, pig hair was used for toothbrush bristles worldwide. Today, pig hair remains the only biodegradable option – and it is a very controversial material. We hope you’ll support our brand as we “vote” with our supply chain. We’re pushing bristle manufacturers to develop better alternatives to nylon. This new bristle that we are now using is the best available option. It’s not perfect, but it’s a step in the right direction. Our bristles can be recycled – please read further details in the Proper Disposal Section of this website. We wanted to our whole product to be ecological, including the packaging. The toothbrush comes in a compostable wrapper made from plants. The outer box is made from 100% paper and is also biodegradable – no tape or glue is used. Our ecological bamboo toothbrush will last just as long as a conventional plastic toothbrush- About 4 months. Bamboo is the fastest growing plant on earth. Because it contains naturally-occurring antimicrobial agents, there is no need for using fertilizers or pesticides during its cultivation. Our bamboo is totally organic and wild. After we harvest a bamboo stalk to use it for toothbrushes, another stalk takes its place and grows to full size within just 2 years — a remarkable growth rate! A little to soft. I felt like I was using a babies toothbrush! I would like the option of a more firm brush! Absolutely love this toothbrush. The bristles are longer than store bought. At first, I was not sure about the handle due to it being a bit rough and now gotten used to it. Well worth buying. We purchased several others for back ups. Highly recommend. I much prefer this natural toothbrush to any others. Love that it is biodegradable! Haven't used it yet, but it seems to be good quality and I like that it is made of bamboo which is very durable. Will be ordering more for my boyfriend and daughter as well. Never been this excited about a new toothbrush but this but I love it! I love how it feels the size is perfect and I will be getting one for everyone in the family! We’ve found our new favorite toothbrush! I love this toothbrush and have ordered four more for my family. Cleans much better than the toothbrushes from the store. Love the feel of the brush. Feels good in my hand & is gentle on my teeth. This toothbrush is eco-friendly, which I love. But my husband brought up a great point to me about it and that is wood is porous. I'm not sure if bacteria is being trapped inside of the pores or not so i had to discontinue use until I can find out, but other than that I loved it. I like it except one thing. The brush head I think is a little over sized,but all my teeth are getting clean and that's what matters. I would buy it again. Think about it. Every toothbrush that has ever been made still exists somewhere. It’s an overwhelming thought. This toothbrush works great and saves the environment. What more can you ask for?! 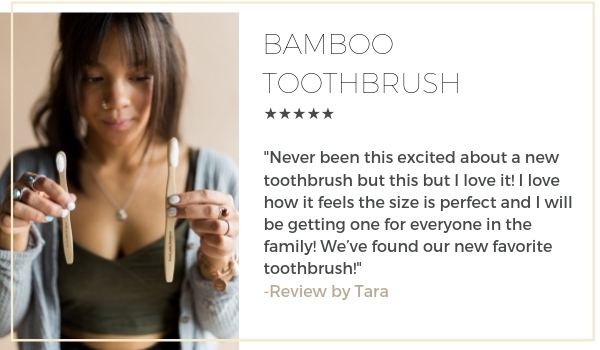 The Bamboo Toothbrush is my favorite toothbrush ever!! It is soft and I feel it really reaches every space in and on my teeth!!! I am so impressed with this toothbrush. The wood doesn't bother me & I have had no issues with the bristles. I ordered one for me & all of my kids & we have loved them!!! This is my second toothbrush I purchased the first was for my husband and he love the way it makes his tooth feels after brushing. I must not have read the description enough when I ordered the toothbrush because I assumed the bristles would also be natural (as in bamboo like the handle). The bristles are OK, being no different than any brush that I would buy at Walmart, just not what I was expecting. The handle takes some getting used to because it, being bamboo, is not flexible like the plastic ones. And it is reminiscent of the wooden tongue depressors in taste. Ugh. This has soft bristles, which is what my dentist told me to get. My gums can bleed - but with this toothbrush and the remineralizing toothpaste, they have not bled. Actually, I need to order a replacement soon! I love the handle but I really look forward to improving the bristles. Fraying and coming apart in two weeks. I know Jade Bloom is working to make improvements so I will try again later. I really liked this toothbrush, especially the fact that it's not plastic. I feel so much more socially and environmentally concsious by just this small lifestyle change. Plus...they work!!! Along with the toothpaste and the PH balanced mouthwash. Very refreshing. Love this toothbrush, soft bristles and I like the look of it in my holder. I love this bamboo toothbrush. It's so much better for the environment and feels good in your hand. I will only use bamboo toothbrushes now. I am glad I can keep some plastic out of the landfill. My first reaction was, "it feels like a tongue depressor In your mouth"! Other than that, it's a really good toothbrush! The wood taste at first reminded me of those, but old wooden spoons for ice cream cups, but you adjust to it. The wood could be a little thinner on the brush end as a bit hard to fit back in by molars. But overall I like it. I really like this toothbrush. the bristles are soft and it pairs perfectly with the remineralizes toothpaste.